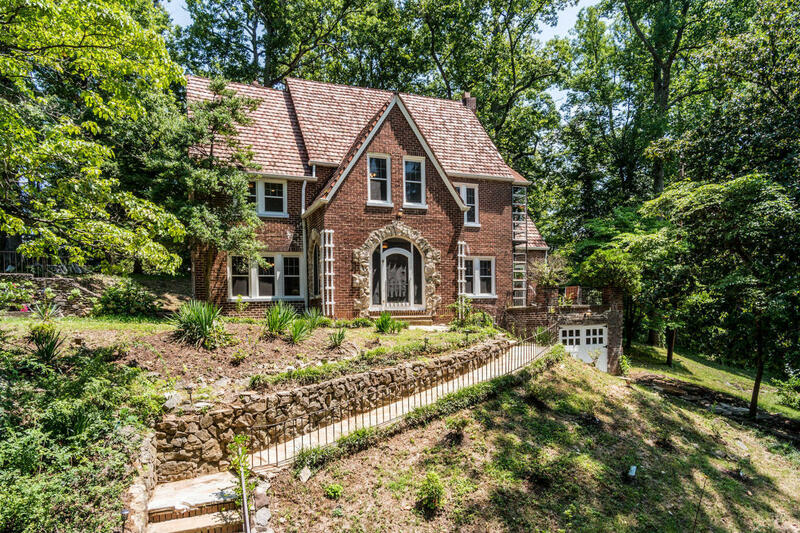 RESCUED FROM RUINATION & TRANSFORMED FROM ''TRAGIC'' TO ''TRIUMPHANT''!This glorious 1930's Tudor Revival-Design Hilltop Mansion has undergone major REFORTIFICATION and now prevails as a ''Pace Car'' for Knoxville's ''Preservation Crusade''. Known as the Abe Schwartz house, This 2-story Brick and Stone beauty showcases a triple arched Front Porch Entry, cavernous Formal Living Room w/ f/place, Formal Dining Room, Hand-Pressed Plaster Walls, New Kitchen w/ Butler's Pantry, Sunroom w/ Walk-Out Patio, Large Master Suite with Walk-In Closet + two other spacious Bedrooms and Dressing Room. Basement Rec. Rm. + 3 storage rooms. Sandstone Terraces/ Patios, Garage, Upper Lot Parking. New HVAC systems/Windows/ and much more. TRULY A TIMELESS ''STAND-OUT''! !